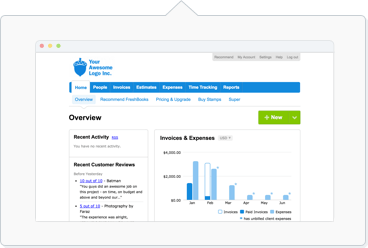 Creating Recurring Invoices is easy in FreshBooks. These Invoices will be generated automatically based on the schedule you choose, giving you more time to focus on doing what you love. Perfect for those subscription-based Clients with whom you provide ongoing work on a recurring basis - check out our blog post on recurring invoices here. If you've set the Start Date to today, the first Invoice will be created once everything has been Saved. If you'd like to Invoice for your time tracked on a recurring basis, you can set up your Recurring Template to automatically add any unbilled time for you. This will generate future Invoices with any time tracked during that period for you, automatically. You will now have any future time entries automatically imported onto this Recurring Template. Dynamic variables allow you to substitute placeholder text with the appropriate date or time value when the Invoice is generated from your Recurring Template. Be sure your variables are correctly formatted with no spaces. You can view Recurring Templates by going to the Invoices section and clicking on the Recurring Templates text above the list. All Recurring Templates will display the frequency and the number of Invoices left to generate (if applicable). Click on Pause Recurring and the template will no longer generate new Invoices. To restart it, simply repeat the above steps until you get to the last step - select the Restart Recurring button instead. How come I don't see the option to make my Invoice Recurring? Recurring Invoices can only be made from brand new Invoices. If you have saved the Invoice at all, the Make Recurring option is no longer available. Click on Make Recurring under Settings and continue with making your Recurring Invoice. Don't forget to delete the original Invoice after when you're done! What do each of the statuses on my Recurring Templates mean?